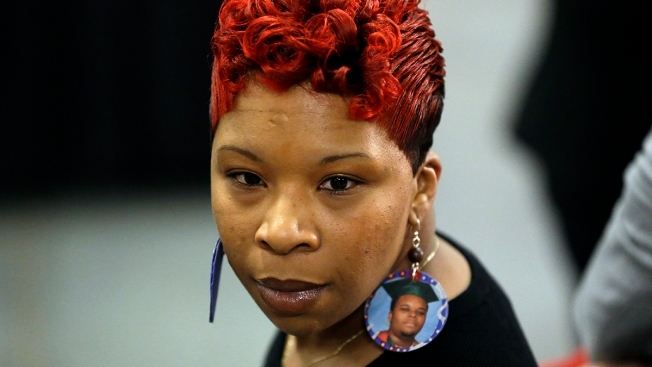 In this Dec. 11, 2015, photo, Lesley McSpadden, the mother of Michael Brown, attends an event by Democratic presidential candidate Hillary Clinton in St. Louis. Michael Brown's mother was defeated Tuesday in her bid for a seat on the City Council in Ferguson, Missouri, where her son died in a police shooting that helped give rise to the national Black Lives Matter movement. Lesley McSpadden finished third in a three-way race in Ferguson's 3rd Ward. Unofficial St. Louis County election results show the winner was Fran Griffin. The race also featured Keith Kallstrom, who was the incumbent. "I congratulate Fran on her victory. I feel proud of the positive race we ran, and I loved talking to the Ferguson community," McSpadden said late Tuesday night in an emailed statement. "Tomorrow, the work continues and I intend to be a part of it no matter my position. I'm not going anywhere." Brown, a black 18-year-old, was fatally shot by white Ferguson police officer Darren Wilson on Aug. 9, 2014, touching off months of protests and violence. Wilson claimed he was forced to shoot when the unarmed Brown came at him menacingly after attacking the officer during a street confrontation. A St. Louis County grand jury's November 2014 decision not to indict Wilson sparked renewed unrest in the St. Louis suburb, where two-thirds of the 21,000 residents are black. This clip from the documentary "Stranger Fruits" claims to show Michael Brown the night before he died. "I wanted to go back and do something right in a place that did something so very wrong to my son, and I think that's what my son would want as well," McSpadden, 39, said in an interview with The Associated Press prior to the election. She had pledged to make police accountability one of her top priorities. McSpadden, who spelled her first name "Lezley" for an autobiography but said she otherwise goes by Lesley, was new at being a candidate but has been at the edge of politics since her son's death. She's been front and center in the national Black Lives Matter movement. She endorsed Democratic presidential candidate Hillary Clinton in early 2016, at a time when Clinton was fending off a primary challenge from Vermont Sen. Bernie Sanders. She was among seven "Mothers of the Movement" who appeared on stage at the Democratic National Convention in 2016. Those mothers lost children in police shootings, in police custody or from gun violence. Also in 2016, McSpadden testified in favor of a Missouri Senate bill aimed at increasing use of police body cameras. In the aftermath of Brown's death, Ferguson's criminal justice system drew heavy criticism for its treatment of poor and minority residents. Police were accused of singling out blacks for unnecessary traffic stops and harassing them on the street. The municipal court was accused of heaping on fines for minor offenses. While the U.S. Department of Justice also found no grounds to prosecute Wilson, the agency's blistering report of the police and municipal court practices led to a consent agreement requiring reforms that are still being implemented. McSpadden's campaign drew skepticism from some in Ferguson. LaTasha Brown, president of the Southeast Ferguson Neighborhood Association, said she was concerned that McSpadden mostly campaigned from afar rather than getting in touch with the community. The people of Ferguson, Missouri, held several events this weekend to mark the second anniversary of the death of Michael Brown. The 18-year-old was shot and killed by former Ferguson police officer Darren Wilson on August 9th, 2014. 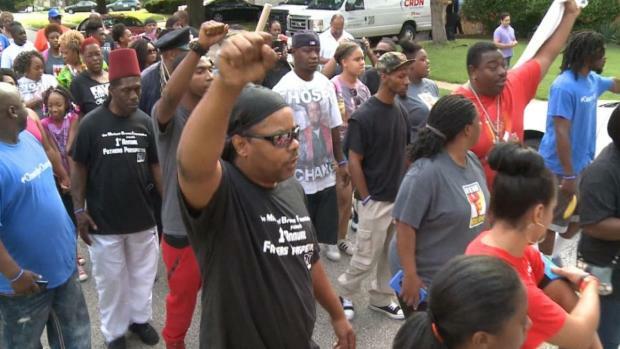 The annual Michael Brown Justice Walk was held Saturday, led by Brown's father Michael Brown Sr. The walk for justice started at the spot where his son died and ended at his high school. "The 3rd Ward needs somebody who's going to mingle with the people," Brown said. "You can't make change from a distance. If you don't know what your constituents are going through, if you're not there to hear what they're saying, how can you lead these people and make decisions for these people?" Griffin did not immediately return a phone call for comment Tuesday night. Both she and Kallstrom have long been active in Ferguson. Griffin has served on several boards and commissions, including serving on the city's Parks and Recreation Board. Kallstrom was a councilman for 10 years, took seven years off, then won three-year terms in 2013 and 2016. McSpadden said she moved to Ferguson a year ago from a neighboring community specifically to run for the council. "I wanted to come back to a place that caused me so much pain and did me so wrong, and to do something right," McSpadden told the AP.